I don’t want to do a 2018 Retrospective. Sorry. I was going to go back and reread every article I wrote in 2018 and select my best picks but, nah. You want to do that? That’s a pretty good idea. I was very insightful this year. I predicted a lot of things not because I am especially smart but because I spent 7 years of trial and error honing a strategy for predicting things and it’s working out because I use an analytical, data-driven approach. You are smart enough to have done it. You easily could have. You didn’t because it’s easier to pay me to do it for you. I don’t change my own oil. I know how. I think I learned in the Cub Scouts or something. The Boy Scouts you learn to do stuff but the Cub Scouts are when you’re like 9 and you get an award for watching your Dad change the oil or your grandfather or your Mom or whoever taught you to do man stuff. I feel like I changed my own oil a few times after that and said “I don’t want to do this myself” so I don’t. I pay some dude at Uncle Ed’s to change my oil. I’m not better than him, I just don’t want to do a dirty job in my garage when I can pay a dude in dirty clothes in a dirty garage to do it. So that’s my approach to finance- I’m just a dude changing your oil. You want to change your own oil? Go look it up on Youtube and then go buy the pan and the oil and rags and lava soap for when your hands are all oily afterward and junk and, oh, look at that, you spent as much as an oil change costs and your wife is pissed off that there’s oil residue on her guest towels. What was I even talking about? 2018 has been incredibly taxing on me and we’re about to have another kid in the middle of 2019 and I will probably never sleep again. That’s good, though, because any inefficiencies in my method are about to get ironed out because I won’t have like 4 hours to blow writing an article, I’ll be dealing with a 3 year old and an infant. With 2018 officially over, why not look to 2019? Go read my old articles from 2018 if you want – there’s good stuff in there. but let’s talk about something else from 2018 instead. Let’s talk about a set that’s basically peaking right now. Battlebond was a smashing success and married everything I want in Magic. I write about EDH, 2HG is my favorite format and I dabble in finance and Battlebond checks all of those boxes, making the Conspiracy set the first 2 Conspiracy sets wish they were. So what’s peaking right now? Let’s take a look. With very few exceptions, EDH is where these cards are being played, which is a huge plus for EDH players since no one is fighting them for the cards to a large extent. Other EDH players are, though, so it’s time to get some of the stuff that’s showing signs of twitching. When you sort by most-used on EDHREC, it’s predictable at first. I bet you can guess the first 5 cards. Also, saying it’s 5 cards is a hint. Also, your peripheral vision is probably picking up the answer because I’m displaying the pic below. I’ll just link it now, you know the answer, it’s the lands, I didn’t trick you at any point. Blue, White, Green, Black, Red, in that order. Of course the two Blue lands are played the most, that’s obvious. What wasn’t obvious was how much play Spellseeker was seeing. At 1,174 decks, this isn’t EXACTLY a staple but if you compare that to the number of copies of Luxury Suite, 1,344, and you realize that all of the numbers are pretty low. Remember, the numbers in ratio to each other is more important than a raw number. A raw number can’t tell you much but the fact that Spellseeker is in half as many decks as Morphic Pool and almost as many as Luxury Suite tells you all you need to know. This is $4 on TCG Player which is high for a rare, except not the highest it could be. 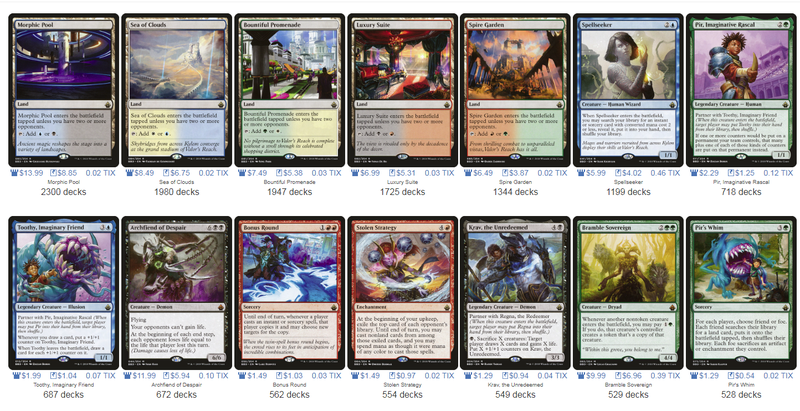 Besides the 5 Battlebond lands, Seedborn Muse and Diabolic Intent are worth more. 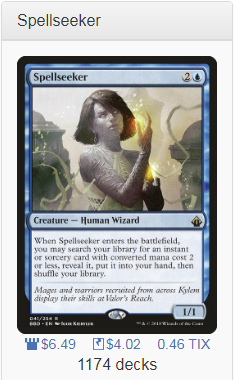 Spellseeker has strong EDH metrics, has a non-zero amount of Legacy play (3 results on MTGTop8, which isn’t nothing. There were 89 results for it in Competitive EDH events). This is half the price of Morphic Pools and played half as much. 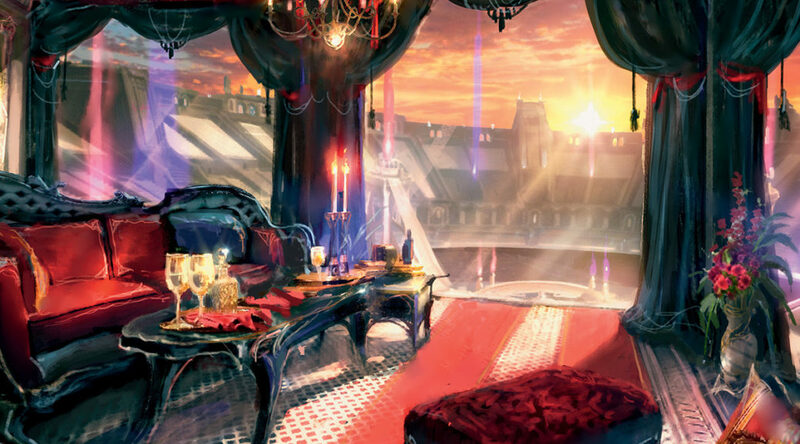 Do you think the price of Luxury Suite will stay the same? If it goes up, I expect this to go up just as much. I’d peg its price to .5x Morphic Pools or 1x Bountiful Promenade and buy accordingly. Oh, and this is a $32 foil, so it’s pretty clear people are aware of how powerful this is. It’s not going to spike as easily as, say, Archfiend of Despair, but considering that already happened, this a better play considering there is still time to buy in. Also, Archfiend is played less – half as much per EDHREC. Speaking of cards whose prices will likely rise and fall together, let’s look at another pair of cards. I don’t think there is a 10:1 ratio between mythics and non-mythics and as little play as both seem to be seeing in an absolute sense, Pir’s Whim sees play in half as many decks as Spellseeker and made a lot of EDH writers’ Top 10 lists this year. Pir’s Whim is under the radar and like it or not, short of it getting played on The Command Zone, it likely will be for a while. That’s too bad because the card is actually bananas. It says land card, not basic land card. You could blow up 3 Sol Rings and go get a Gaea’s Cradle with this. Bramble Sovereign is good but it’s demonstrably not much more popular than Whim but it’s perceived to be more popular. 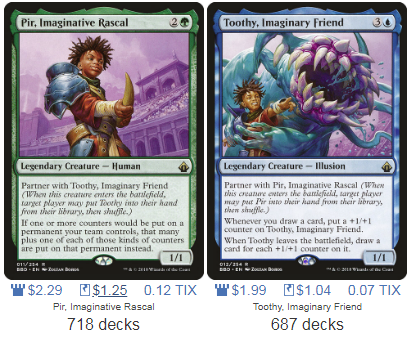 Another great thing about Pir’s Whim is that at $7 or so for foil, there is room for growth. It debuted at around $15 and has been sinking since, but if it ever starts to rebound, it’s going places. 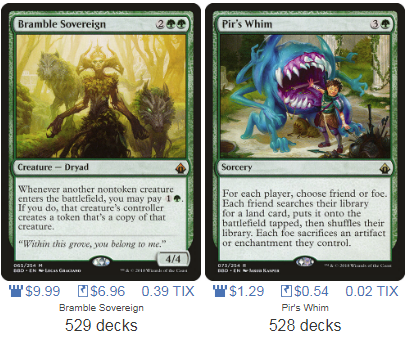 We got less Battlebond than we wanted and it’s unlikely a card called Pir’s Whim will get a reprint anytime soon, so that $7 foil could be $15 again before you know it. Even more popular than the Lannister twins, these foils are $10 each and not as common as you may think. The buylist market price on Pir is the same as the retail price, which may be a fluke but may also indicate a price change is incoming. Interestingly enough, these are actually cheaper on Card Kingdom than on TCG Player, which means the market is moving the price faster than a retailer can keep up with. It also means their buylist, usually the gold standard, is only about $4. I don’t know what the disparity means, but I do know that most people tend to get their signals from TCG Player so you may be able to get a near arbitrage going with the $7 foils on Card Kingdom. The price of these toofy bois is going up, I can feel it deep in my molars. These are both pretty underrated cards in terms of what people say they like from the set but when you look at what people are actually playing versus what they say they would play, you get cards like this, cards I called in past set reviews and took heat for, overperforming expectations. At 550ish, these are just below Archfiend and above Bramble Sovereign. Should these be worth more than a buck or two right now? Hard to say they should given that they see a 5th as much play as Morphic Pool. Would it surprise you to know Bonus Round is sold out at $8 in foil and Stolen Strategy is almost sold out at $12? Bonus Round has been flat around $8 for a minute but if it’s beginning to sell out, take notice. Strategy is on the downswing and $12 might not be the floor, but considering the demand here is identical almost except for the possibility of play in other formats (couldn’t find any evidence of that on Top8) I think these prices will eventually be the same. Whether they’re the same at $6 or the same at $15, that’s your call. 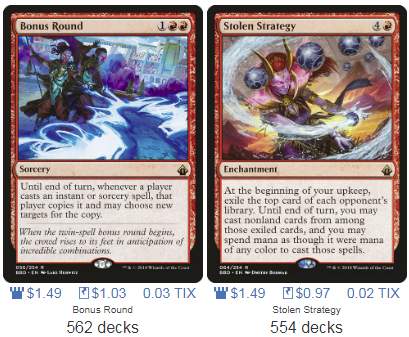 I will say after Najeela and the lands, Bonus Round is the 5th-most-played card and Strategy 6th and it’s tough to argue with data and apologize to me for telling me I was dumb to say a do-nothing red Enchantment was worth playing at the same time. That does it for me this week. Battlebond is beginning to ripen and with no supply on the horizon, those lands are prime to hit the $10 I know they can be. Buy the other stuff accordingly and keep reading my dumb ideas in 2019. A blind squirrel finds a nut every once in a while. Until next time!